Are you a planner? Do you like to know what you’re going to do and how you’ll go about it? Or, are you someone who acts impulsively, going by the seat of your pants? Artists, like other humans, usually fall into one of these two categories, and the way they work is what gives their art its distinct character. I think I fall more into the planner category. I like to think about what I want to paint; then I look through images that inspire me. After that, I sketch a painting to see if the composition works, then go to my canvas. I have a color scheme vaguely in my mind, but once I start painting, the colors seem to evolve as I decide what will work together. I try to create a place where I’ve been, or where I’d like to be, and that usually involves many details, so planning is necessary. 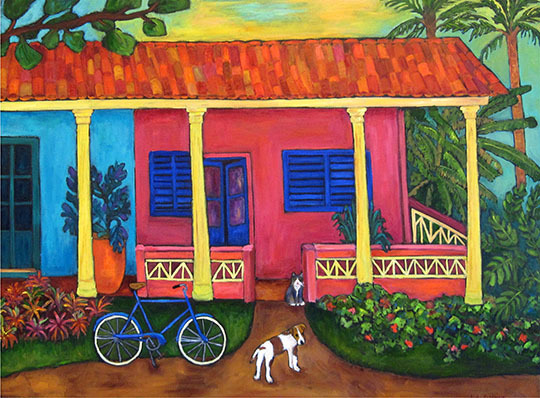 “House in Vinales” is inspired by a trip I took to Cuba. I wanted to convey the warmth and strong colors of the small houses there, but then got involved with the other things: the bicycle (the main means of transportation), the animals (there are many), the shutters, and so on. Likewise, while painting “Under the Red Umbrella,” I wanted to show the objects that make a patio setting cozy and inviting. So I had to plan to include things on the table, as well as patterned pillows on comfy chairs. Although I do get into the “zone” of the painting process, I can’t deny that I’m a planner! 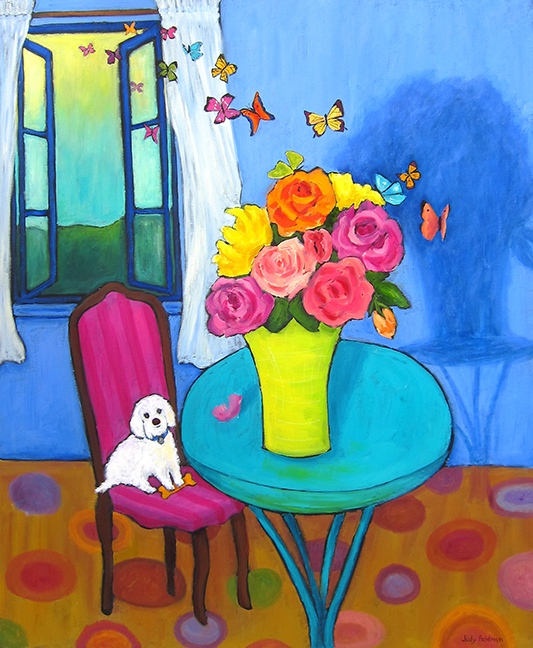 What’s it like to be an intuitive painter, who just goes at it, without much of a plan? To find out, I called a few Wilde Meyer artists, and found out that some are planners like me; while others have different ideas. It’s always so interesting for me to hear about their process. 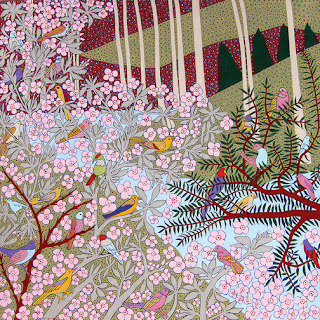 See more paintings at Wilde Meyer Gallery. Joseph E. Young is kind of a planner, but he approaches painting in a very different way. He wants to create a dream world, one that’s similar to ours, but with another set of rules about composition and imagery. Like me, Joseph has a plan, and he also likes to work from inspirational photos. He clips things from magazines and newspapers, to use as reference in his paintings. But once he gets started with his first image, he starts wandering around the canvas, adding elements such as flowers, butterflies, trees and animals. For example, in his painting “Big Horned Cows,” Joseph said he started by painting the two cows, then he kept adding layers of different objects. “As I work, I try to make a home for the image,” he explained. His work is figurative, but very stylized. 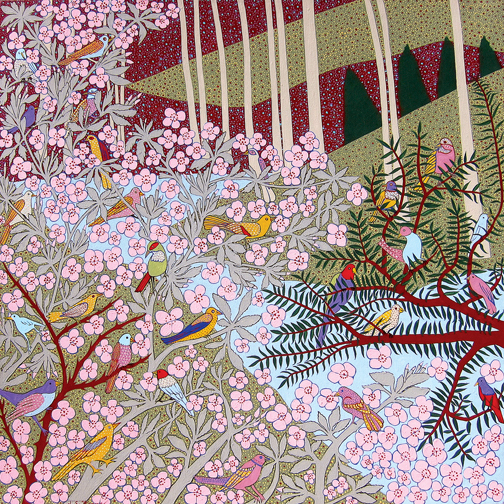 Joseph told me that he loves pattern, and is especially inspired by 18th century wallpaper. “I’m really a decorative painter,” he said. “I love to make things flat, rather than three dimensional. If I want to suggest depth, I use overlapping planes. You can see this skill in his painting entitled “Cowboy and Two Dogs in a Landscape.” Although the work is very flat, he still conveys to us that the young man is sitting on a bed of flowers, and that one of his dogs is trying to reach the fish in the water. There is so much to see in Joseph’s paintings! Looking at this one again, I see small bears climbing a tree, along with his lovely butterflies (he calls them jewelry), his favored orange flowers, tulips and fish. There’s something allegorical about his work. His dream worlds are so pleasant and inviting! In my next blog, I'm going to feature two other artists who approach painting in a very intuitive way. I think you'll definitely see how their work reflects this process. In the meantime, check other paintings by Joseph on our website.